History is repeating itself a little south of our green valleys. In the past ten weeks eight koalas have died trying to cross a road named Appin through their once pristine bush habitat. Which misses the point of why they're getting into the road - migrating to food trees on the other side. And; 'The NSW Government will also draw up plans to reduce koala roadkill on Appin Road, Campbelltown'. Last Sunday, June 3rd, the combined communities voice of this area was loud and clear in a united call for elected representatives and the NSW Government to STOP the carnage and decimation of our unique koala population and habitat. Plans to draw up plans to merely reduce 'roadkill' probably isn't going to cut it or alleviate a growing disdain for the 'environmental narrative' coming out of the incumbents which doesn't sit well beside ever more announcements of plans to cut down now measurable amounts of forest left or allow broadscale environmental vandals to merely 'offset' their destruction somewhere, sometime...perhaps...and still leave all they've destroyed as just that. The 'Koala Strategy' has come under severe critcism since its release, and again in the aftermath of last Sunday's rally. 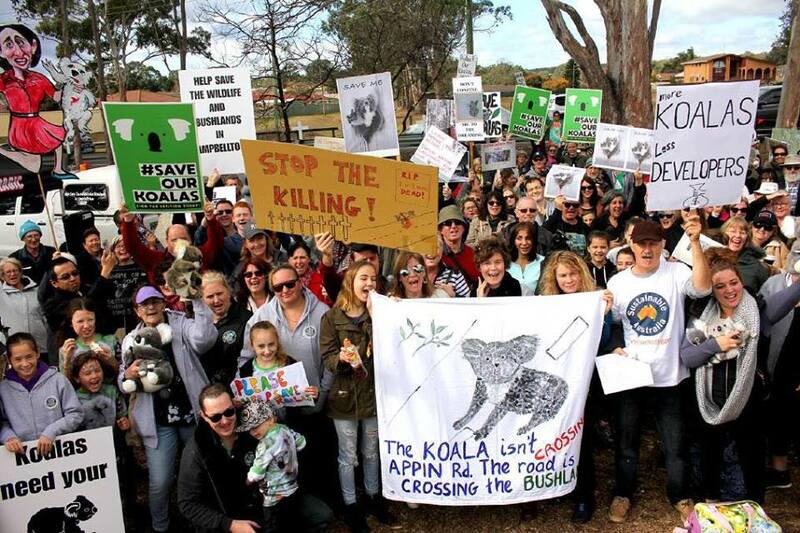 What was made apparent at the rally is that no new housing development proposals should ever have been approved without the creation of a cogent and detailed Koala Preservation Strategy and for that to be in place prior to commencing. Several key councils in the Greater South West - Liverpool, Camden, and Wollondilly - were represented at the rally although Campbelltown Council, which approved the Mt Gilead development proposal which will transform the entire area, was not represented. 1. That the NSW Government preserve core Koala habitat NOW. The current NSW Koala Strategy recently released failed to identify the significance of the disease free koala population spanning Wollondilly, Campbelltown and Liverpool local government areas in South Western Sydney. 2. Protective fencing in conjunction with existing fauna friendly culverts under Picton Road, as well as on Appin Road and the Hume Highway would help provide safe passage for our koalas. We need a timeframe for fencing to be built at road kill hotspots to avoid any more koala deaths on our roads. 3. We want the NSW Government to defer any further release of land within the Greater Macarthur Growth Area and Wilton Priority Growth Area until it prepares and finalises a comprehensive Koala Conservation Management plan for South Western Sydney that protects koalas and their habitat corridors throughout the region. 4.We also need funding assistance for the provision of koala care facilities in South Western Sydney and additional funding for scientific research in the area. Most would also add in a Fauna Overpass - if squillions are to be made in yet another 'developers first eveything else last' exercise then who should foot the bill for that fauna saving bridge or bridges is plainly obvious. Humans have one chance to get this right to protect the last disease free Koala population in NSW. Once its gone - it’s gone! Let this be an instance where History Doesn't Repeat itself. The Berejiklian government’s planned koala reserve contains only 2% of high quality koala habitat and offers no significant new protection for the species whose numbers are rapidly declining, new analysis has shown. The North East Forest Alliance obtained and analysed maps of 24,000 hectares of mostly state forests that the government plans to use for a koala reserve system, which is a major plank in the government’s long-delayed Koala Strategy, unveiled on May 6. 82% of the “new reserves” offer no new protection to koalas. That is because 82% of the “new reserves” were already protected in forest reserves. Only 2% (554ha) of the new reserves are high-quality koala habitat. This assessment is based on the government’s latest koala habitat modelling. Hunting will be permitted in 8 of the 12 areas because they will be designated Flora Reserves. All the reserves are in the hinterland, away from the coastal forests where the best koala habitat exists. Less than 2.5% of the “new” reserves match the proposed Great Koala National Park. North East Forest Alliance spokesperson Dailan Pugh: “It is fraudulent for the NSW Government to pretend that these are new Koala Reserves. There are many state forests known to be far more important for Koalas that the Government has ignored. National Parks Association Senior Ecologist Oisin Sweeney said: “It is clear the government has made a choice – it is timber over koalas. Quotes from the Nature Conservation Council CEO Kate Smolski: “Koala populations on the North Coast have collapsed by 50% in the past 20 years and the NSW Government’s strategy will do little to redress that decline. “If the Berejiklian government was serious about saving our koalas from extinction it would ending native forest logging, strengthen land clearing laws and create the Great Koala National Park.